Hauck Heat Treatment (Letchworth) is the most diverse within our organisation, providing an unrivalled range of heat treatment processes under one roof. Serving local, national and international industry the site specialises in processes for the Aerospace, Defence and Nuclear sectors. 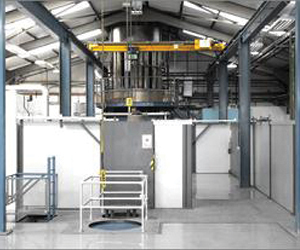 The site also houses Hauck's Near Net Technologies innovations - sometimes referred to as Hot Isostatic Pressing (HIP) facility, performing corrective casting consolidation processes as well as undertaking Net Shape and Near Net Shape projects, using the very latest Powder Metallurgy techniques. A fully equipped laboratory and an extensive transport network support the production facilities.